Kaart van de Residentie Riouw en Onderhoorigheden. 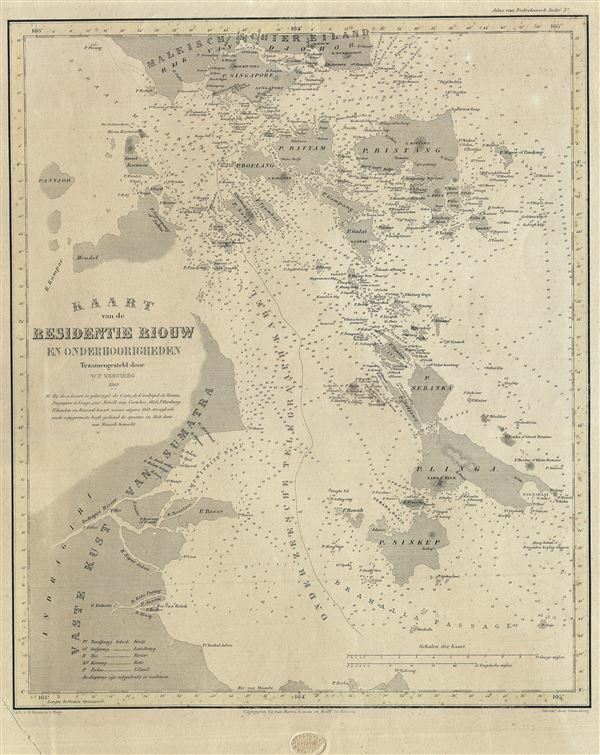 This is a scarce and beautiful 1860 map of the Riau Island Province in Sumatra, Indonesia. The map covers from southern Malaysia and Johor Bahru to Singkep Island or Pulau Singkep of the Riau Islands. Includes the Riau Archipelago and the Island of Singapore. The map offers considerable detail throughout, noting several islands, cities, rivers, straits and other topographical features. It also notes countless depth soundings, offshore reefs and a wealth of other practical information useful for navigation. The underwater telegraph cable from Singapore is also noted. This map was published by van Haren Noman and Kolff, Batavia, for issue in P. Baron Melvill van Carnbee and W. F. Versteeg's Algemeene atlas van Nederlandsch Indie. Haren Noman en Kolff, Algemeene atlas van Nederlandsch Indie door P. Baron Melvill van Carnb´ee en W.F. Versteeg, Batavia. Very good. Overall age toning. Margin extended over lower left corner.